Four years ago Ken Livingstone warned that London's transport system was on the brink of crisis. Roads were approaching gridlock and severe overcrowding, unreliability and equipment failures on the London Underground were making travellers' lives miserable. The solution, said Mr Livingstone, was major investment to increase capacity on public transport, a congestion charge to free up the roads and low fares to lure people out of their cars. So four years on, how far has the crisis been averted and how can it be avoided in the future? A consensus seems to have been reached among all three main parties that the Labour mayor's major success has been buses. 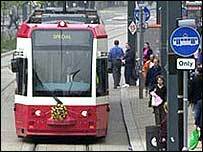 Could trams mean south London is no longer the 'poor relation'? New accessible buses and expanded services have brought the biggest increase in passenger numbers since World War II from 4.2 million every weekday in 2001 to more than six million. He believes bendy buses which struggle to squeeze through London's narrow streets, should be scrapped and full use made of existing buses. One of the key ingredients of bus success has been congestion charging which cut congestion by 30% and consequently speeded up bus journeys. And while the Tories will not go as far as to call congestion charging a success, most agree it has done what was asked of it. 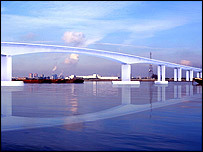 Such success has encouraged the mayor to take the project a step further. He now wants to extend congestion charging to Kensington and Chelsea, an unpopular prospect for local businesses who fear falling trade. Liberal Democrat Lynne Featherstone said an extension which is all about raising revenues is unworkable and would unfairly allow Kensington and Chelsea residents free entry into the central charging zone. In his 2001 transport strategy, Mr Livingstone pledged a freeze on fares but last year saw an unexpected sharp rise particularly on outer London buses from 70p to £1.20. He explained the fare rise was necessary to cover interest on his £3.3bn borrowing. 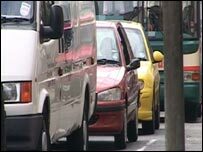 But London Transport Users Committee, a passengers' watchdog, believes higher fares send people running back to their cars. Ms Featherstone added: "Ken made his name on his 'fares fair' campaign, now it's more like 'fares unfair'. "Passengers think Ken's fares are ridiculous." For London Underground (LU), the past four years have been turbulent times. In 2002, Mr Livingstone made an unsuccessful legal challenge against the government's decision to part-privatise the Tube and in return for him dropping the case, the government handed over control of the network. In the meantime, LU entered a 30-year public-private partnership contract with infrastructure companies - an agreement that a House of Commons report criticised for costing the taxpayer £1bn. Liberal Democrat Ms Featherstone said the contract needs renegotiating. "The companies are already falling behind on their contract. "They need to do their work more efficiently and ensure working trains are reliable - the Tube contract is diabolical." Her criticisms were backed by Transport for London Commissioner Bob Kiley who said on Wednesday that the Tube's efficiency and reliability were embarrassing, if not disgraceful, and must change. Mr Evans however said he would not want to unscramble the contract but wanted greater communication of Tube timetables and alternative routes. Spurred on by his success on the buses, Mr Livingstone said last year: "Over the next four years we will be extending the kind of improvements we have already made to London bus services to the Tube." Other schemes aimed at easing the burden on the Tube are Crossrail - a west to east London link planned for 2013 - and trams in the south. An extension of Croydon's tram network to Crystal Palace could go some way to reverse south London's experience as the poor relation, said LTUC. But according to Ms Featherstone much more needs to be done to create orbital transport and give people a choice to get out of their cars. So four years from now, will transport be back on the brink of a crisis or making inroads into Mr Livingstone's dream of providing the best system in the world? Mr Livingstone believes his five-year, £10bn investment programme gives him a once-in-a-lifetime opportunity to deliver. "Over my first term, we made significant improvements to the transport network including the introduction of the world's largest congestion charging scheme and the transformation of London's buses," he said. "This has resulted in a shift away from car use towards public transport. We will now be extending the kind of improvements we have already made to the wider transport network." Will the early worker catch the Tube?